From “Fashionable Seven Komachi” This is an allusion to a poem that Emperor Yōzei had copied down for the poet Ono no Komachi (834–900) and to which he requested her to send a poetic answer. This prompted her to change just one character and send it back – since by that time she had withdrawn from the world. Utamaro is parodying this so-called parrot episode by depicting two women who are obviously fighting with each other using the same words. Late in her life when the poetess Komachi was living in retirement in the countryside, the Emperor Yōzei, who was extremely fond of poetry sent her a poem in hope of receiving a reply. Komachi, realising that an answer was required, but feeling somewhat imposed upon, replied by changing one syllable in the Emperor’s poem, thoroughly altering its sense. This became known as the Parrot episode in her life, and was frequently depicted in ukiyo-e, usually with a letter changing hands. 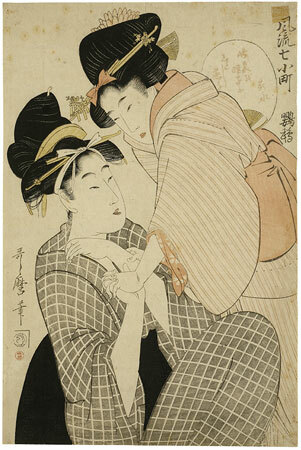 In Utamaro’s design the mother seated on the right seems to have been teasing her daughter by repeating back to her what she said. The daughter, with any angry pout on her face, is trying to force her to stop. The girl has a fan tucked to her sash with a haiku by Shinsui, the actor Bandō Hikosaburō III, about a young swallow. Since “swallow” is a word used for a young man who is loved by a middle-aged woman, the two women could be quarrelling over a man they both care for. Reproduced in: Ingelheim catalogue, no. 64.